benzyrnill, 旎宫嘉坊: rain season from dripping bless heavenly. rain season from dripping bless heavenly. these 2 dawns both dreamed of enemies and my revenge. yesterday on my jog route, the old sinister, an elder man, a mad cow, again challenged me physically, took a narrow way in advance me. he copied my route twice, always bragged his mule energetic and orthodox. It really disgusting me but I trusted God the killing upon profane, anytime anywhere. it took me longer to roam when I caught sight of my mission on the earth progresses so step by step and devising broken. God dad, enemies took our road to sabotage our beautiful world's descending. near my dorm, the neighbor room of my dorm, is a half size room previously for cleaner keeping tools, now occupied by dorm administrative staff, a likely lesbian. dorm authority previously never put woman among mans' area, but the cheap cow insisted lodging among all man dorms, just for steal and spying me. day by day it hided herself in the shabby shelter to surveillance me, to profane me. likely she arranged that to take advantage of public asset for private interest, or the SOE under PRC tyrant's direction to threaten me with the trick. as to larger aspect, these 2 weeks quite satisfying: dorm internet access upgrade to chinaunicom fiber optics, whose download speed stable at 2MB/s. upload speed almost the same. I completed downloading OSes on our raspberry pi within 2 hours for 2 or 4 system images. with the utility, I can safely try more Linux distributive and more prepared for Linux world which so attractive comparing Microsoft under PRC blackmail. now my son and my raspberry pi both equipped with more elegant OSes, ready to go further and higher on the ward free informative universe. the ISP in the pass week gradually picked up to surveillance me. it already blocked me 2 days last week, forced me surfing domestic sites includes its homepage, where I found cheap but gracious mobile phone number with modest data plan, 15 CNY/mon. I had already persuaded by its sms to have a free of charge deputy phone number, but later contact refuted me saying the data plan includes deputy card requires at lease 128CNY/mon consuming. but on the website, I saw an independent phone number only costs 30CNY, so I immediately ordered one, in rhythm of rain in an aimless night besieged by deadly blockage from open web. It's so meaningful and rewarding, that I can't wait to add the new asset to all my zhone GA contacts. Monday express informed me the arrival of the sim card and I fetched immediately, even the staff of the unicom missing and handled over her colleague. Sunday I busy with trying enable other 2 GA chrome device management within google admin panel before woz returning from his painting class his mom arranged years. even failed due to google policy, we glad the 2 GA didn't bundled with central administrative which usually bans full google play store access, as status quo. my son uncertain about my blame last Monday upon his adopting a corrective glasses his mom suggested in favor of Chinese so said innovation, but never trustworthy. he tried to flattered me by turning on English podcast proactive as I frequently urged while he always loosed to abide. but I don't care, and glad to reunite him in the fruitful weekend. his internet ISP once boasted speed of 30MB but never satisfying, rather just lagging and broken frequently, likely in PRC surveillance's ordain. I even can't update his Linux smoothly there. each time when I visit my son and launch update, it's bottle neck and upset our patience. God laughs the dirty trick and burning brains wasted among all ghosted communism China wholly in ash. God dad, I'm so contented by my new internet that I here end this post soon. grant my son satisfying web and rich content of play. grant us ward free web, for otherwise I see only darkness of dictator propaganda, coarse of manipulation of social consciousness. bring me sooner my Royal China, my Crown Queen from Japan, Asoh Yukiko. bring me closer my dream land and peace of God's mercy upon Chinese and China, my vested land from my glorious ancestor. thx for this sunny morning, Dad God. 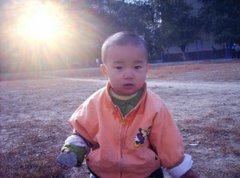 dreamed with my son roamed in remote place near Tianjin, northern China, my university city. I carried my passed mother's corpse and search for service to bury it. we were refuted once for too expensive. then near country fair we met Gao Jun, my once alumnus who soon after army train in beginning of PRC campus migrated from our major Philosophy school into Economics, but stayed in dorm of our class girls. her husband or brother inquired our problem and extended his help, out of Chinese taboo, while Miss Gao remained her self-possessed normally among guests in her spacious house in my dream. we likely rested there and waited for more money remit from our relatives, or aided by Gao to settle our funeral. the northern China countryside scene lonely detailed in dream, different from my hometown, central China. last night it drizzled, left wet ground when I went to dorm canteen for breakfast. last night I put 2 pillows in stack and its the highest pillow I ever had with my own, for the cover of my pillar sent to laundry and no replacement. I always admire American family pillars in its episodes, large and soft and qualifies, but never found within domestic market includes online e-commerce. yesterday I half day roaming in dorm, except reading informative web as routine for one or 2 hours. my life more and more turned like an elder's, or even worse, like those retired gathered in gate ball game yard outside near my dorm window view. they found no fun in the game, no challenge, no exciting, but just gather and moving. still there are fights among common Chinese, like the dorm canteen. the operational couples loathed to invest more on food materials, but spare no efforts to advertise, to celebrate its anniversary. the result is fewer and fewer customers. I usually have less than a bowl meat in a week there together. it doesn't hurt me much as a mandated vegetarian, but let me slender. and the business possibly reined by PRC surveillance against me. recent months my throat more and more choked by phlegm, I had to cough hard to spit it. my backbone also turned inflexible: after standing up it takes quite few seconds to waist straight from sitting. usually the most exciting moment in a week is gathering my son, woz, on Sunday weekly. his sinful mom tentative separates us, frequently change my son's timetable to drive my son away from my side. God dad, the drizzle turns heavier. dad God, my life runs full and merry. no matter how sinister attempted to ruin it. grant us our web business booming and self-relies. bring us sooner Royal China for better future. bring me my Crown Queen from Japan, Asoh Yukiko, for my second baby, billing zhu. God dad last salary means so much for us. my worn shoes, which embarrassed me again last raining Sunday when it was wet being handled to spa keeper, now replaced by new one. my son glad with his new chromebook bag he chose his own. God dad, in coming alipay credit returning day, let us anxious free. thx God dad, for surfing hard time so smooth regardless PRC war time preparing period, thx for skipping us from trifle grudge in the failing and doomed authority. this month my salary from QRRS exceptionally supportive: nearly 600 additional totals ￥3600, and my younger brother gifted me ￥200 for update my wrecked shoes. with it, I bought my son, woz birthday cake a dearest one, ￥128 fruits cake titled 和风莓语. we designated praying for Japanese spiritual and English.the cake shop near my dorm and kindly offered us a set of stainless steer cake knife and forks. my son lately returned from his school, near 7 pm, for his school forced even grade 7th students to have night class aiming better performance in rat race entrance exam of elite senior middle school. his mom this time actively joined us in celebration. woz, and all us likely enjoyed the delicacy, fruit cake. after first round of eating cake, my son lent himself to my planned task abrupt, setup his new account in google chrome for easy access family asset book. that lasted more than an hour and wonderfully done. I then left, urging my son listening and watching more English as cliche. on bus station, the last bus line missed. I walked 2 bus stops to return my dorm, and busy with publishing video and photo captured in the ritual birthday onto web till 11 am. in this deep sleep I dreamed 2 kind of different animals, 獾 badger and a kind of Chinese sound like "揉", both like sloth or pangolin. the training and performance of district summer sports game Qiqihar municipal requisites on going now again, near 8 am and loudly outside. I saw in these days how the expropriation costs, esp young lives, their decency and creativeness in change of collective cheap mob. dad, my son's class was lucky out of the chaos. guide us away from burning turbulence of PRC war time preparation. grant us our job meaningful and rewarding material and spiritual. in this windy morning, dad God, let the world witness how plenty our joys, perfections in our living spectrum.